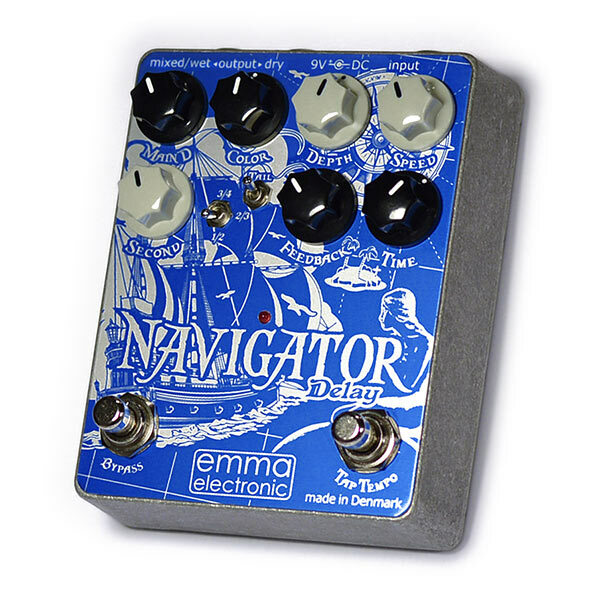 Since the turn of the millennium (that’s the year 2000 for you guys who like numbers) Emma Electronic out of Aarhus, Denmark have been making some of the most fun and awesome-sounding pedals known to music-kind. Founder, electronics engineer and owner of one of the best music stores in Denmark, Jan Behncke isn’t like other pedal makers. Where others may have started out by making their take on the holy grail of distortion, Jan took a road less travelled and instead sought to make the world’s best envelope filter – and boy did he succeed! The DiscumBOBulator still stands as a true landmark in the auto-wah world, just look at the rigs of Ida Nielsen, Pino Palladino or Adrien Belew for a testimony to that, but Jan has also churned out some of the most ambitious amp-like drive pedals throughout the years. 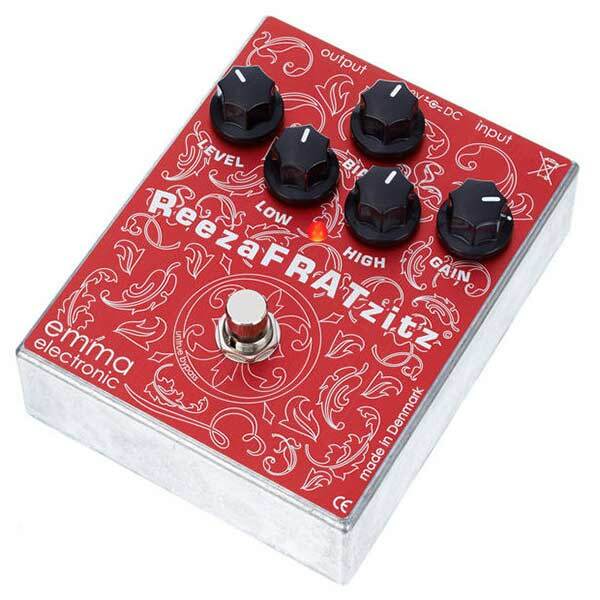 From the versatile boost and crunchy drive tones of the OnoMATOpoeia and StinkBug, the righteous roar and heavy grind of the ReezaFRATzitz and PisdiYAUwot, the subsonic fire of the Okto-Nøjs octave/fuzz and all the way to the magical and atmospheric Navigator Delay, Emma’s names may be hard to pronounce, but the tones are more than easy to love. 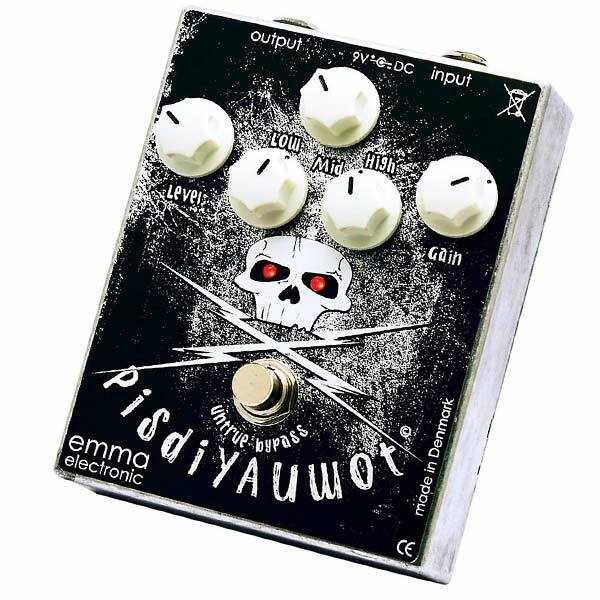 In addition, Emma Electronic also has created the AmARHyll range of pedalboards. All sport a classy minimalistic Scandinavian design and are built from high-quality powder-coated aluminium, which results in highly roadworthy yet lightweight boards. Now add the excellent TransMORGrifier compressor to the line-up and you have one of Denmark’s best kept sonic secrets. The Navigator Delay is the pinnacle of elegant simplicity. It offers everything you need in a compact delay pedal and nothing you don’t. Dual delay heads, tap-tempo, modulation, beat-splits, trails, wet/dry outputs, all this and more in a neat yet pedalboard friendly package and in a pedal that’s really simple to use. Combining the best of analog and digital technology, the Navigator Delay offers practical and usable delay functions in a unique configuration that can generate classic delay tones, as well as many unique new sounds. While the Navigator’s hybrid circuit keeps the dry signal path 100% analog, to avoid signal latency and digital sterility. The delayed signal is created using a custom-coded DSP that allows for delay times of up to 1 second which can be adjusted via tap-tempo and also beat-split to create rhythmic, “multi-tap” effects. This is then fed back into the analog realm where Color, Level and Feedback controls add additional warmth and realism to the effect. In addition, a digital modulation section can create a variety of optional secondary effects to the delay repeats. From tape echo “warbles” to lush chorus and flanging, they’re all here in spades to provide you with all the gooey warmth you could want. Adding to the pedal’s feature set, is a separate Level control for the second, beat-split delay repeats, which perhaps is the most unique feature of the Navigator Delay. This option allows the user to emphasize the second delay voice or to turn the main delay off entirely, allowing you to create interesting and all new rhythmic effects. The second delay has the option to be set at one-half, two-thirds or three-quarter intervals against the main delay, allowing for “dotted eighth” and other classic multi-tap delay sounds. The Navigator may very well be the most feature-laden, yet simple to use compact delay pedal on the market. More importantly though, it simply sounds gorgeous. If you’ve been lost in the sea of digital despair, let the Navigator lead you home to a land of tonal bliss! 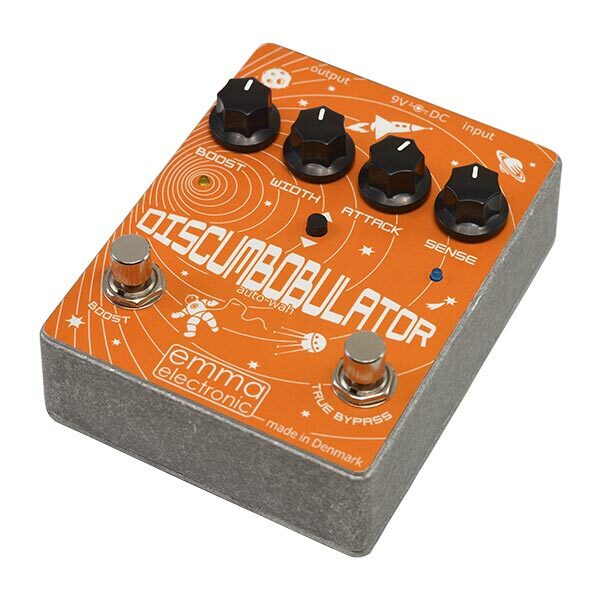 The original DiscumBOBulator was often heralded as being the world’s best auto- wah/envelope filter pedal. So how do you improve a pedal that’s already flawlessly funky? Well, start out by making the filter-triggering even better and extend the dynamic range and feel. Now triple the headroom signal, so the pedal handles the red hot signals of active bass pickups and line level inputs like a piece of cake. Finally you add an independent 10dB boost that’ll make funky solos take flight instantly, and you have the new improved DiscumBOBulator V2. Boasting everything from full-on funk tones to old-school cocked wah sounds and all the way to unique synth-like tones, via its super-intuitive control set, DiscumBOBulator V2 truly is the definition of cool! • Wide frequency spectrum – making it suitable for any instrument. The goal of the DiscumBOBulator V2 was to create an envelope filter pedal that would be able to handle everything from super-fast single-note lines to denser signals such as complex chords, without getting mushy. The pedal’s proprietary all-analog circuit does just that while letting the full spectrum of your preferred instrument through, making this auto-wah perfectly suitable for everything from guitar to bass to keys… heck, throw flutes or violins at it or whatever you’ve got on hand, we promise that they’ll all pass with flying quaky colours and that you won’t experience any of the nasty volume peaks or dips that are common to other filter pedals out there. ￼￼￼￼￼￼￼￼￼￼￼Just when you think you’ve seen and heard it all in an over flooded pedal market, from the deep rises a bass behemoth so crushingly brutal that it makes Godzilla look like the easter bunny. The Okto Nøjs takes your signal and turns it into pure subsonic fire. It spits and sputters sizzling, synthy octa-fuzz tones left and right, all while running it through an earthshakingly deep analog octaver for unprecedented levels of bass brutality. 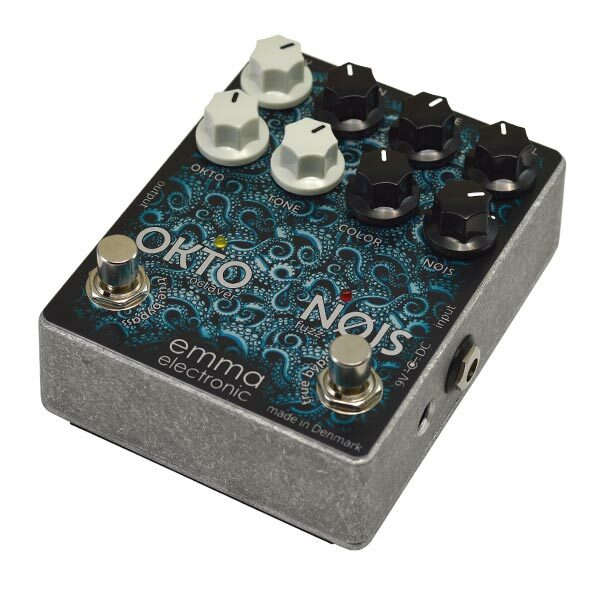 The Okto-Nøjs is actually two pedals in one – a super-accurate, fast-tracking Octave down (the Okto) combined with a dynamically re- sponsive, synth-like Octave-Fuzz (the Nøjs). Both sides of the circuit are 100% analog and feature high-quality buffers and true bypass switching for the best sound quality possible. The Okto channel uses proprietary tracking circuitry to create a sub-octave that locks in fast and remains stable. The Okto can track ac- curately down to the open-E string of a Bass Guitar, and even lower with minor note wobble. The Okto’s Tone control can go from round, fat subs to the hollow, nasally honk tone. Blend in a bit of Okto with your Dry signal to subtly thicken your bottom end, or crank it up for spot-on note doubling. The Nøjs section is where the real fun starts. A harmonic distortion generator that creates a unique Octave-Fuzz effect, the Nojs circuit reacts to playing dynamics to create spitting, swelling, synth-like drive sounds that are truly out of this world. Gain, Tone & Level controls adjust the Nøjs circuit’s Fuzz section, yielding everything from smooth overdrive to squelchy feedback distortion with a blossoming note filtering. The Nøjs control blends in a square wave sub-harmonic that can be thick & meaty or edgy & aggressive depending on the set- ting of the Color control. Both Okto & Nøjs sections can be blended to taste against the Dry signal to cover a wide range of colors from subtle to extreme. 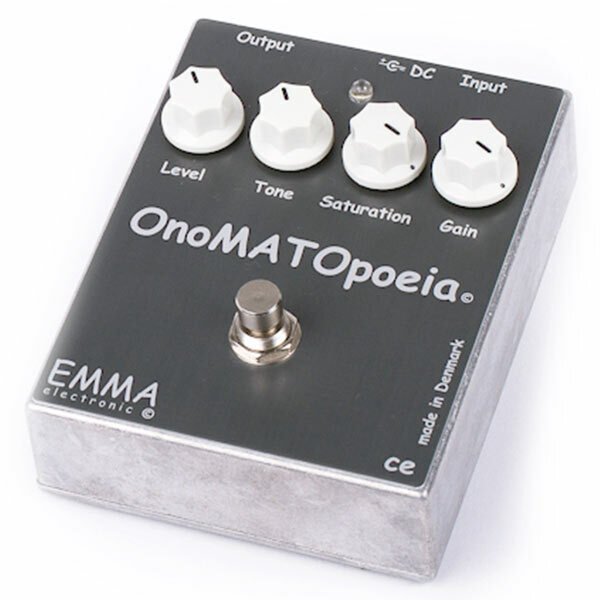 Come get your freak on with the Emma Electronic Okto-Nøjs! • Highly sculpt-able EQ and wide gain range – From low-gain to blistering blues-rock tones. It’s all there! The idea behind the StinkBug was to create the ultimate “classic” overdrive pedal. Something that beautifully distils the best parts of a vintage drive pedal, while alleviating common issues like overbearing mids and nasal, fizzy tones on higher gain settings. Hence a lot of work was put into getting the mids and gain structure just right, all while keeping the body and character of your instrument completely intact. The Low and High EQ dials give you a ton of different tones on tap. Turn them both down and the midrange comes out, but without being nasal. Turn them up and the mids gets slightly scooped, while still keeping the sound full and punchy. Oh and then there’s the gain! Oooooh boy, it’s warm, smooth but with that sweet harmonic tube-like crunch that we all know and love. 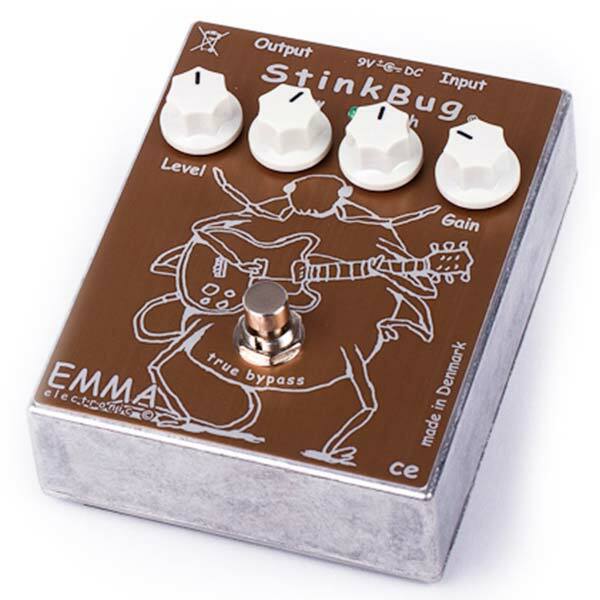 Just picture the bluesy bite and dynamic drive tones of Stevie Ray Vaughan, Eric Clapton and John Mayer and you know what you’re getting yourself into with the StinkBug. You may have guessed it already, solely based on the looks of the PisdiYAUwot, this beast was made for METAL! The gain stage is raw and brutal yet extremely clear and defined. The EQ options are staggeringly versatile to say the least. The sound? Earthshakingly awesome! Chords, fast runs and triplets stand out with a clear and potent punch. No more mushy wobble, just power! • Extremely tight and transparent attack – no mud, all metal! The PisdiYAUwot is pure fire. It’s lightning in a bottle. It’s what every other metal pedal out there wishes to be. It’s the sound of a tight and punchy high-gain amp in a box, ready to bring down the house on your command. The EQ section pots are optimized to work in interaction with each other, and the gain range is extremely wide. Turn down the MID a bit, turn up the HIGH and get that old school Pantera like scoop. Turn the MID up, the HIGH down a bit and the LOW up, and you get a very modern in your face mega power distortion. Want it more brutal, turn the GAIN down a bit. Want it more gritty, turn it up. This pedal will bring speed, power and clarity to any metal guitar player out there. The OnoMATOpoeia is basically a sonic super hero. Clean boost by day, dirty overdrive by night and with some serious superpowers hidden up its sleeve. It’s the secret sauce your pour on your tone when you want that extra Oomph! That extra Kapow is what you kick in when you need your solos to soar or your rhythms to roar! TransMORGrifier takes everything you know and love about old analog stompbox compressors, then adds some nice modern improvements to the tonal equation. This means you can get the squish and the squash without having to sacrifice the natural body of your core tone. 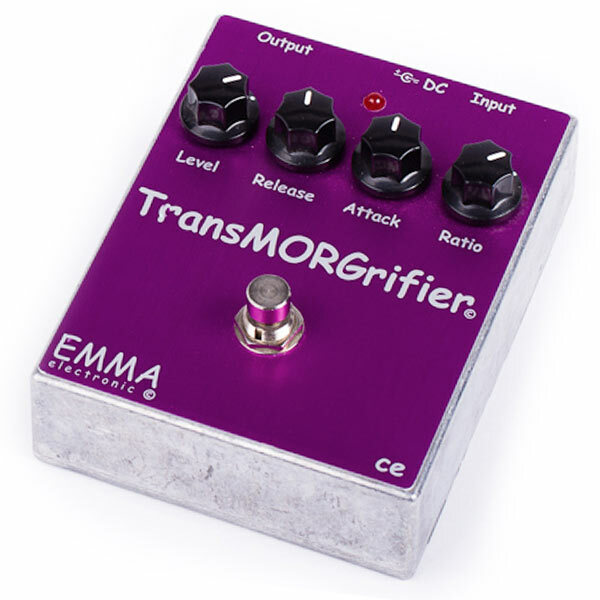 From transparent studio-like comp tones to overly compressed vintage chicken-picking tones and anywhere in between, you’ll find it all in the TransMORGrifier! • Wide frequency spectrum, making it suitable for any instrument. Emma Electronic’s founder, Jan Behncke didn’t feel that any of the boards on the market offered a good enough solution to house and transport his pedal creations, hence he took it on himself to make the perfect modern pedalboard. Something that looked elegant all while being lightweight, sturdy and flexible enough to serve musicians and their changing needs for a lifetime on the road. The result? 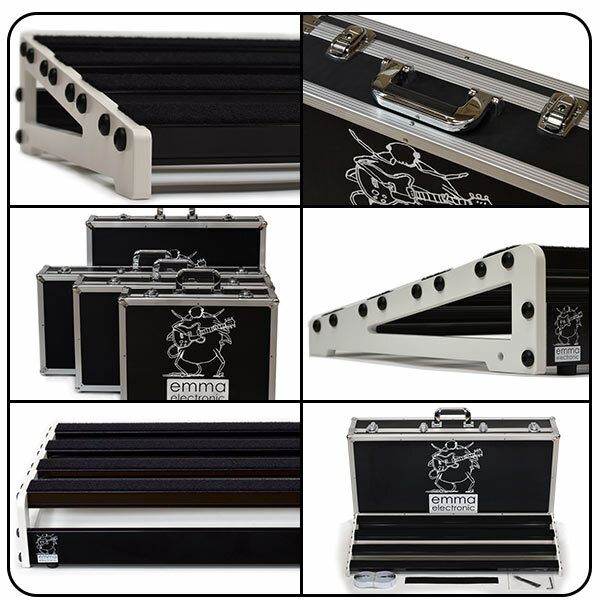 The super classy AmARHyll pedalboard range. The lineup features 4 different sizes, AmARHyll 44, AmARHyll 61, AmARHyll 61 Deep and AmARHyll 76. All sport a classy minimalistic Scandinavian design and are built from high-quality powder-coated aluminium, which results in a highly roadworthy yet lightweight board. The AmARHyll boards angled designs leave ample room for even big and clunky power supplies underneath, so they don’t end up taking precious pedalboard real estate , while at the same time making cabling simple and safe. On top of that, each board comes supplied with velcro, cable strips, torx wrench and a durable hardcase. The front profile protects the cable connections and the flanges underneath make it possible to attach all your cables with the strips provided. 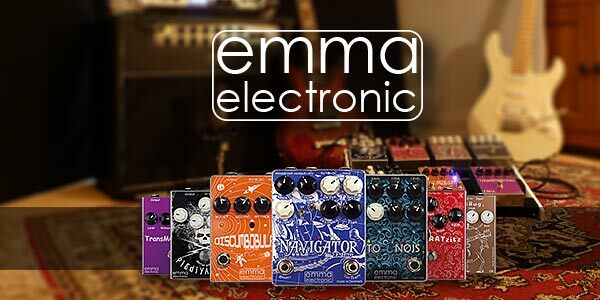 This beautiful pedalboard series by Emma Electronic is shipping now. Audio Distribution Group is proud to be the exclusive distributor for Emma Electronic for all of Europe.